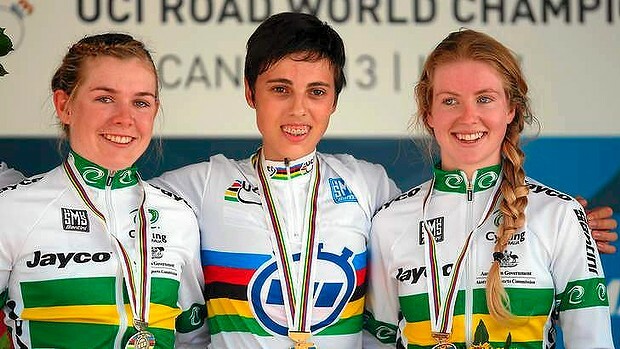 It just keeps better for Aussie cycling’s generation next. As if dominating the Junior Track Worlds earlier this year in Scotland wasn’t enough, our U23 Men and Women (once again, it must be said) blitzed the ITT events in Tuscany overnight. In the women Australia’s Alexandria Nicholls and Alexandra Manly claimed silver and bronze respectively, whilst it was gold for Damien Howson and 4th place for Campbell Flakemore in the men’s event. Not a bad return, and one that may well be repeated in the U23 Road Races on Friday, possibly even surpassed given the outrageous depth quality on show that will see 19-year old sensation Caleb Ewan unleashed for the first and only time at this year’s Titles (albeit on an unsuitable course). Even more remarkable is that Australia’s U23 team in Italy doesn’t even include WorldTour riders such as Michael Hepburn, Luke Durbridge and Lachlan Morton who are all still U23, or Rohan Dennis who only graduated into the Elite Men’s age bracket a few months ago. Talk about a vintage crop of young riders. The future couldn’t really be much brighter, could it?